Your weekly round-up of the East Antrim teams involved in the Ballymena and Provincial League. Intermediate Division: Rathcoole stay one spot and two points ahead of Saturday’s opponents, eighth-placed Dunloy, after they rescued a point with a last-gasp goal. 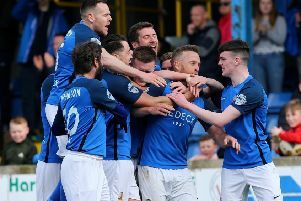 The Newtownabbey men trailed 2-1 before a 91st-minute free-kick earned a share of the spoils. Leaders Balynure Old Boys secured a 3-1 win over Killymoon Rangers. Castle Star remain bottom of the table after their 4-0 defeat at Desertmartin. The two sides go head-to-head again in the McReynolds Cup this weekend at Dromore Park. Other results: Magherafelt Sky Blues 5 vChimney Corner 2. Junior Division One: Defending champions Ballyclare Comrades Reserves slipped up when they lost 2-1 at home to Magherafelt Sky Blues. Second-bottom Carnmoney will be hoping to bounce back from Saturday’s 6-1 defeat to Cookstown Olympic when they travel the short distance to Carrick to take on Woodlands on Saturday. Glen Willis scored Woodlands’ only goal in 4-1 defeat away to Cookstown RBL. All three goals arrived in the first-half as Mallusk Athletic edged to a 2-1 success against FC Whiteabbey. Adam Sloan gave Mallusk the lead before Gerard O’Neill doubled their advantage. Whiteabbey hit back with a 40th-minute goal from Niall Southam. Other results: Antrim Rovers 6 v Desertmartin Swifts 3. Junior Division Two: Ballyclare North End lost 2-0 at Moyola Park Olympic, while goals from Conor Graham and Jonny Kane gave Ballynure Old Boys ‘B’ three points against Remo. Junior Division Three: It was a bad day at the office for bottom side Carnlough Swifts who slumped to a 15-1 defeat at Mountainview. Gareth Peoples (5). William Cushley (4), Billy Brown (4), Gary Madden and Craig Irvine were on target for the home side. Leaders Whitehead Rangers eased to a 4-0 win over Remo FC Reserves. Glenn Jones, who has been in superb goalscoring form this season, netted all four for Whitehead. Rathcoole Reserves defeated 3rd Ballyclare Old Boys 5-2 thanks to a Ross Blair hat-trick and strikes from Gary Dixon and Ryan Price. Danny McFall and William Sharkey netted for the Old Boys. Linda Welshman Memorial Cup R2: Junior Division Two leaders Krag Albion booked their spot in the next round thanks to a 5-0 victory over Ballysillan Swifts. Albion were clinical in front of goal with Jonny Robb (two), Lee Lowry (two) and Lee Cooper finding the net. Elsewhere, Red Star lost 9-0 at home to Newington YC II.